10. 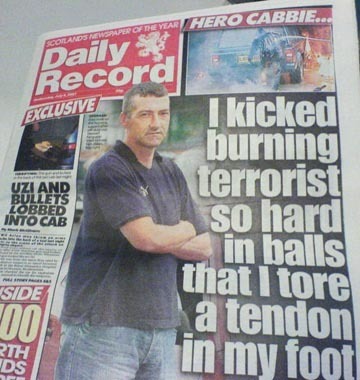 After the bungled Glasgow International Airport attack, one of the terrorists was apprehended by a Scottish cabby who kicked a burning terrorist in the balls so hard he tore a tendon in his foot. 9. The Times Square Bomber, Faisal Shazhad, locked the keys to both his get-away car and his house inside the car-bomb he rigged. The car bomb consisted of a bunch of fireworks stuck in a bucket, and a bunch of fertilizer. Inert, non-explosive fertilizer that only served to muffle the blast. 8. While terrorist “mastermind” Khalid Sheikh Mohammed was hiding out in the Philippines, he kept a low profile by renting a freaking helicopter and making fly-overs of the building where the “cultural dancers” he wanted to date worked. They were impressed enough to allow him to take them on a date. He chose the local Wendy’s.